Note: Starting this issue, I'll be featuring a unique knitting-related product in this column that Knitty readers should know about. Do you have such a product? Write me. Since starting Knitty earlier this year, I've gotten a lot of e-mail asking for information on where a person should go to learn to knit. Until last week, I had no idea where to send them. I do now. 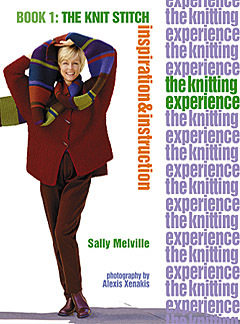 I was fortunate enough to attend a lecture given by Canadian knitter and knitwear designer, Sally Melville. The visit coincided nicely with the publication of her new book, The Knitting Experience, The Knit Stitch. I saw many people buying copies, getting Sally's autograph. I took a few moments before the meeting began and paged through the book, just to see if it had any merit. See, I'm not good at learning things from books. I'd rather have someone sit next to me and show me. But then I met this book. The first page I flipped to showed, with clear step-by-step photos, how to weave in ends. I can't tell you how many times I'd wished to find this information somewhere. Pattern authors assume you'll just know how to do it without leaving a mess behind your work. They shouldn't. Sally doesn't. Bless her. As I worked through the book, I found thorough coverage of introductory techniques from the very first stitch you'll cast on through knitting, shaping and casting off. Sally teaches you how to knit in a detailed, visual, easy-to-follow way. She's intentionally built the book a step at a time, so that you are taught a new skill only when you need to use it. And her patient, encouraging writing style is the perfect knitting coach when you don't have someone available to teach you. Don't miss the "Meditation" index at the back of the book. I loved these writings. Another brilliant innovation is the "Oops!" chapter. It shows the kind of mistakes knitters make and how to correct them. Wonderful! Pages 148-149 will, I suspect, be a surprise to experienced knitters other than myself. Two different problems are addressed and solved in a way I'd never seen before. I can't wait to try these solutions! The book also includes a great assortment of patterns, all using only the knit stitch. The one on the cover is on my to-do list already. And the Shape It! scarf is really cool. If you want to learn to knit, improve your basic techniques, or just love Sally's funky garter stitch patterns, Knitty wholeheartedly recommends this book. For easy online ordering, Knitty's preferred bookshop is The Needle Arts Book Shop. They ship to Canada and the US and provide excellent, fast service. Check out their wide selection of books for knitting, crochet, cross-stich and needlepoint. And please tell them Knitty sent you!